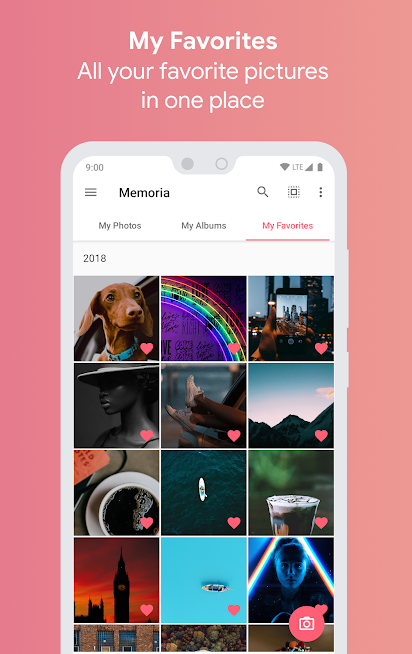 Memoria Photo Gallery Pro for Android is the most personalized photo gallery created with the most gorgeous material design that is fast, smooth and quite organized. It is fast and secure with a beautiful interface that can be personalized to your liking. It is one solid place for all your memories. It is a joy to use and provides the best user experience with numerous customization possible. With many tricks hidden beneath all its features, it is both fast and secure present in a beautiful interface that can be twisted to your liking. Memoria Photo Gallery for Android has a smooth interface that is divided into three tabs, photos, albums and favorite. A powerful app that makes it so easy to open or close folders, view photos. You can just swipe between them to switch between tabs or multiple select items within the tab. Most foods and folder operations can be performed and additionally pin folders to the top, hide folders, switch view modes and sorting options. The photos can be viewed in multiple grid sized including portrait and landscape mode. Press and hold on to the image to zoom it. Save your sensitive photos an unique and encrypted vault and it will be totally inaccessible through any other app. Also, hide photos and access them with pin, password or fingerprint protection. Give permissions to sensitive albums and folders. Smooth and fast navigation lets you see all your media instantly. You can choose to include or exclude albums from the app and mark favorite photos and access them instantly in the favorite tab. Easily sort, group and filter all media very easily and get organized. Memoria Photo Gallery for Android is complete and full to its brim with whole lot of customization possible in the pro version. The main aim behind the app is to provide great user experience as they browse through all the photos and images that take them down the memory lane. The app costs $0.85 to download from Google Play.